Spectacular fully furnished rental thru Labor Day Weekend. 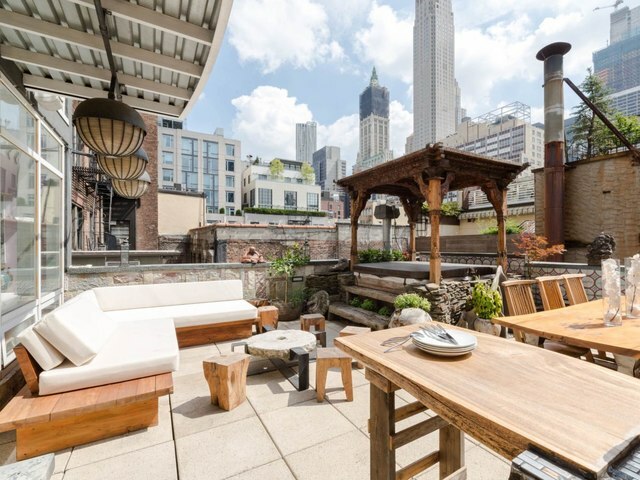 Enjoy the best of indoor and outdoor living at this stunning 1,926 SF TriBeCa duplex Penthouse loft. Luxury 3 bedroom family penthouse designed by French designer with Balanses influence. Two level elevator access to 3 bedrooms on 7th floor and living rooms on the 6th floor, gourmet kitchen with 8 person dining room, leading to walk out access onto a 400ft deck with bbq, teak sofa's, dining suit and Indonesian carved joglo over a six person hot tub. Enjoy epic south facing views of the Freedom Tower, Woolworth building and Ghery building, whilst floor to ceiling windows face north for epic all day light. Perfectly located 1 block from TriBeCa's Greenwich street park, 2 blocks to the West side running and cycling Plath, parks, shopping and Restaurent's and Bars within a 1 mile radius. Peace in the epicenter of Manhattan. Master luxury ensuite bedroom / bathrooms with steam sauna, three child bunk bedroom and queen nanny or visiting couple bedroom. Stunning petrified wood surrounds a remote controlled gas fire place and central AC and heat ensures perfect temperature control. Nestled in a private 5 unit, video doorman secure building, this is the perfect home for a visiting . Key locked elevator opens directly into unit.